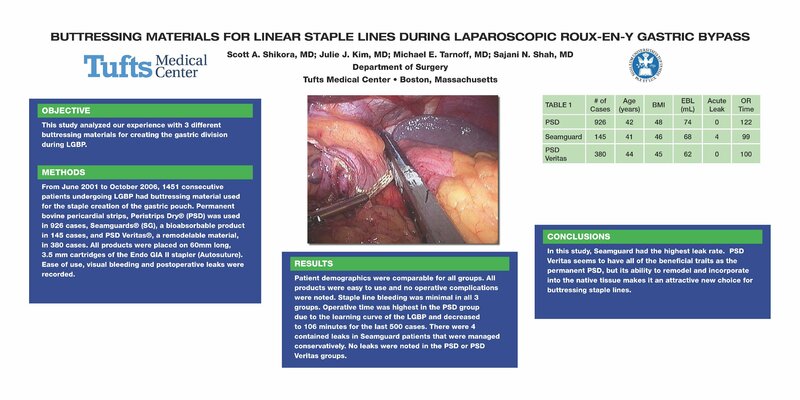 Objective: This study analyzed our experience with 3 different buttressing materials for creating the gastric division during LGBP. Methods: From June 2001 to October 2006, 1451 consecutive patients undergoing LGBP had buttressing material used for the staple creation of the gastric pouch. Permanent bovine pericardial strips, Peristrips Dry® (PSD) was used in 926 cases, Seamguards® (SG), a bioabsorbable product in 145 cases, and PSD Veritas®, a remodelable material, in 380 cases. All products were placed on 60mm long, 3.5 mm cartridges of the Endo GIA II stapler (Autosuture). Ease of use, visual bleeding and postoperative leaks were recorded. Results: Patient demographics were comparable for all groups. All products were easy to use and no operative complications were noted. Staple line bleeding was minimal in all 3 groups. Operative time was highest in the PSD group due to the learning curve of the LGBP and decreased to 106 minutes for the last 500 cases. There were 4 contained leaks in Seamguard patients that were managed conservatively. No leaks were noted in the PSD or PSD Veritas groups. Conclusions: In this study, Seamguard had the highest leak rate. PSD Veritas seems to have all of the beneficial traits as the permanent PSD, but its ability to remodel and incorporate into the native tissue makes it an attractive new choice for buttressing staple lines.